Congress MP from Amrtisar Gurjeet Singh Aujla stood out in the Lok Sabha today. Amid the din in the House with AIADMK members demanding immediate constitution of the Cauvery Water Management Board, Aujla made many heads turn with the colourful message printed on his white Kurta. The Golden Temple in Amritsar, which is the holiest of all Sikh shrines, runs one of the largest community kitchens in the world feeding freshly cooked food to 50,000 devotees on weekdays and over one lakh on weekends and festivals. 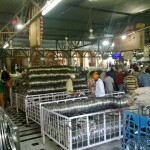 The Shiromani Gurudwara Parbandhak Committee (SGPC), which manages all gurdwaras, has been urging the Centre to exempt the free kitchens at the Golden Temple and other Sikh shrines from the purview of the Goods and Services Tax (GST). Earlier, union food processing minister Harsimrat Kaur Badal had also urged Jaitley to exempt all purchases made by the SGPC for the langar service from the GST. After implementation of the Goods and Service Tax (GST), the Golden Temple reportedly shelled out over Rs two crore extra in 2017 as GST for purchasing ration for the ‘langar’.